A consortium led by FCC, was awarded a 40% of the project by the Government of Antioquia, while a group of local business people will hold the remaining 60%. Spanish environmental services, infrastructure and water group, FCC, has secured a 1.1 trillion Colombian pesos (US$ 433.3 million) contract to build the Toyo tunnel in Colombia. The ten-year project will include six years of construction work, six of construction phase and two-and-a-half for operation and maintenance. The rest of the time will be spent on the design phase and any necessary pre-construction work. Once completed, the tunnel, at 9.8km, will be the longest of its kind in the country. Actually, the complete project also includes 12.3km of tunnels, 9.8km of which will make up the Toyo tunnel, added to the new road leading to Urabá. The project is located between the municipalities of Giraldo and Cañasgordas, around 500km north-west of Bogotá, and it consists of building a new road section, 40.84km long in two directions with one lane in each. There will also be a dual carriageway section with two lanes in each direction. This section will pass through the mountains of western Antioquia, in an area that is difficult to access. 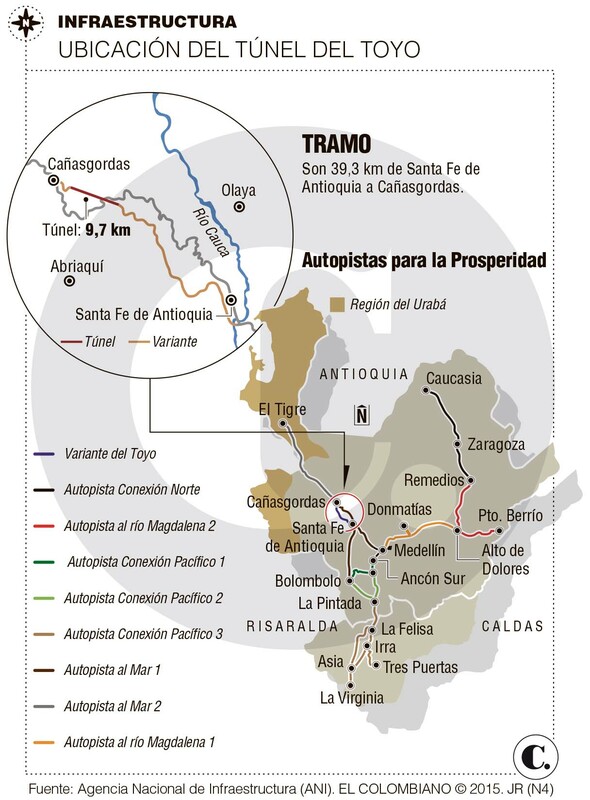 The road network – in conjunction with a current highways programme – is expected to cut journey times between the capital of Antioquia and Urabá from six hours to around three-and-a-half hours. Moreover, the highways Mar 1 and Mar 2, forming part of the Autopistas de la Prosperidad programme, amongst other infrastructure in the region, will also contribute to this shorter journey time. Finally, good news for the local economy: it is estimated that the project will directly create over 1,000 jobs.